The CPD training engages teachers in tested classroom activities that they can incorporate into their own practice. It also provides informed inputs on how global learning can support practice across the curriculum rather than reside in traditional subject silos such as Geography and Religious Education. 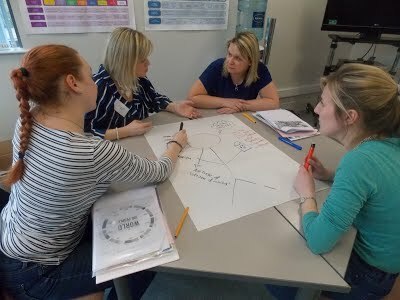 Teachers are given the opportunity to design topic webs showing how they can bring a global learning lense to curriculum topics such as ‘Might Me’, ‘Water’ and ‘Houses and Homes’. The curriculum connected learning topic ‘Mighty Me’, for example, enables children to ‘explore the opportunities they have to positively influence life in their communities and in the wider world’ (CCEA, 2014). Connected learning is an important component of the training as it indicates how global learning complements the different learning areas and cross-curricular skills as well as other related school initiatives including ‘Eco-Schools’ and ‘Rights Respecting Schools’. The central focus of the training however is on enhancing teachers’ understanding of key global issues and increasing their confidence in addressing these issues with young people in the classroom. Many schools have traditionally supported charitable-based solutions to poverty in the global South which Bryan and Bracken see as ‘underpinned by a development-as-charity framework, and dominated by a “three Fs” approach, comprising Fundraising, Fasting and Having Fun in aid of specific development causes’ (2011: 15). The development-as-charity approach is often driven by development non-governmental organisations that regularly fundraise in schools as part of their campaigning or ‘educational’ activities. It can also be underpinned by school textbooks. For example, Bryan and Bracken’s 2011 research study of how development education is taught in schools in the south of Ireland found that a ‘number of discourses and narratives contribute to de-contextualised and superficial explanations of development “problems”’ in school texts (15). Of course, the media too plays a hugely significant part in fostering paternalistic attitudes toward the global South based on the idea of the ‘benevolent donor’ making a difference for a ‘grateful receiver’ (Ibid: 5). “The course was delivered in an enthusiastic and highly engaging way. It has encouraged me to integrate these ideas into my own practice and perhaps in my school as a whole”. “Provided me with different strategies to use and look at different perspectives and reasons why things happen”. “Gave me a better understanding of how to apply ‘cross-curricularly’ and embed into all areas of the curriculum – not in isolation”. The training created “awareness of inequality, globalisation – what our children need to learn / develop to become responsible global citizens”. The dominant challenges presented to the GLP are how to quantitatively deliver training to 50 per cent of schools in Northern Ireland and qualitatively ensure that it meets teachers’ expectations in terms of content, facilitation, resource support and knowledge and understanding. In terms of the first challenge, a total of 371 schools have participated in the training to date which keeps us on track to reach our 50 per cent (528) target by July 2018 when the programme finishes. And qualitatively, the GLP has been monitored and evaluated by a research team at Ulster University and their most recent report suggests that teachers ‘appear to be displaying greater motivation and more confidence in their understanding and practice of global learning’ (CGE and UU, 2016: 31). Further evidence is being gathered through school case studies of practice, pupil and teacher focus groups and interviews, and year-on-year questionnaires that will support comparative analysis. These findings will be presented in a final research report later this year but the project has already derived several positive outcomes. It has: heightened the profile of global learning in schools and supported connected learning; created new opportunities for professional development at a time of contracting school support through CPD; generated new resources including a high quality, interactive web site (https://www.globallearningni.com/); and re-energised the development education sector in the north of Ireland through their collaboration on the programme. Above all, the GLP has enabled, at least some teachers, to move beyond charity-based ‘solutions’ to poverty and engage with the structural causes of persistent poverty in the global South. This is a necessary first step toward the formulation of effective actions that will bring about positive and durable social change. Bryan, Audrey and Bracken, Meliosa (2011) Learning to Read the World: Teaching and Learning about Global Citizenship and International Development in Post-Primary Schools, Dublin: Irish Aid. CCEA (2014) ‘Mighty Me: Ideas for Connected Learning’, CCEA: Belfast, available: http://ccea.org.uk/sites/default/files/docs/curriculum/connected_learning/icls/years_4_6/yr4-5_mighty_me.pdf (accessed 20 April 2017). Centre for Global Education and Ulster University (2016), ‘Global Learning Programme Year 2 Research Report’, available: http://cge.avec.solutions/sites/default/files/GLP%20Research%20Report%20Year%202%20OCT%202016%20.pdf (accessed 20 April 2017).